Samosas are one of my favourite Indian snacks. You can find them all around the world and it would be hard to find someone who has never eaten one. They are best eaten warm and crispy… I like them so much that I had to learn how to make them at home, as I believe that home-made food always tastes better. 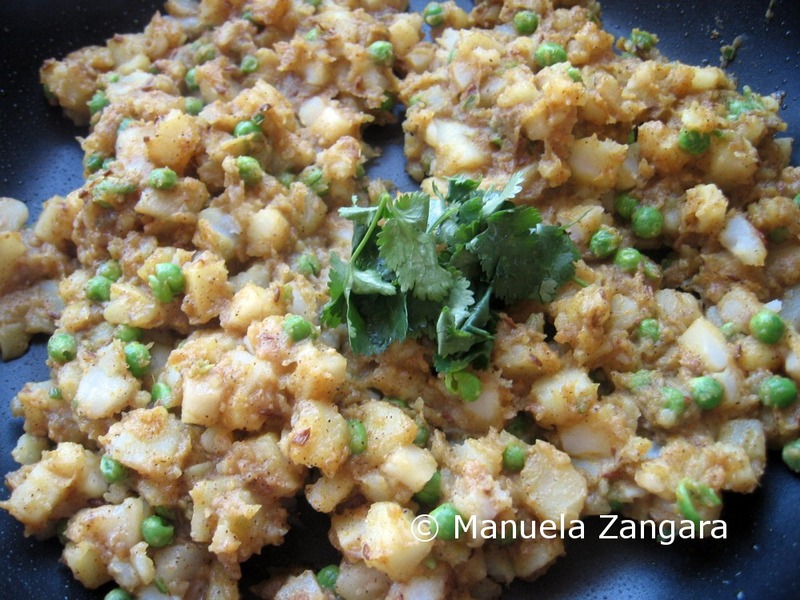 I make them with 3 different fillings: with potatoes and peas, with minced lamb and with both fillings mixed together (which is my family’s favourite). 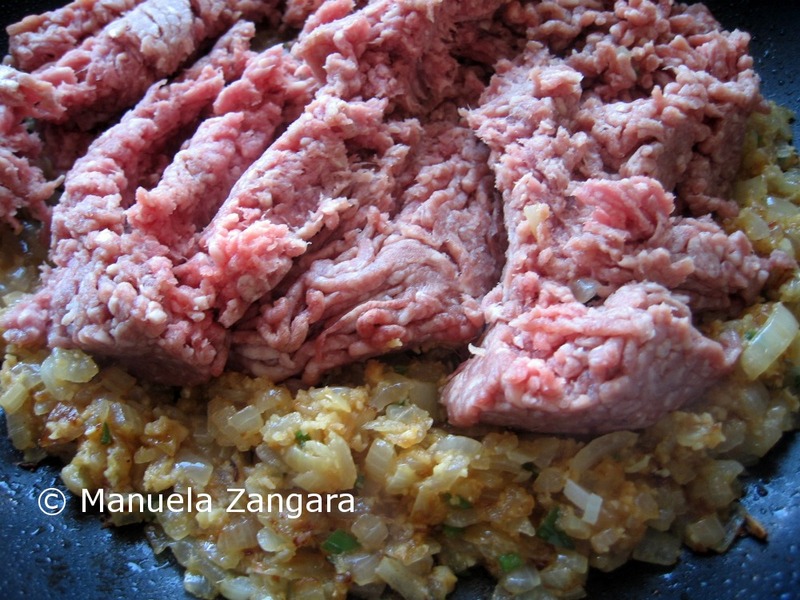 I am going to give you the recipe of both fillings, so you can chose which ever one you prefer to make. Serve them hot with some sweet and sour tamarind chutney (imli ki chutney) on the side. 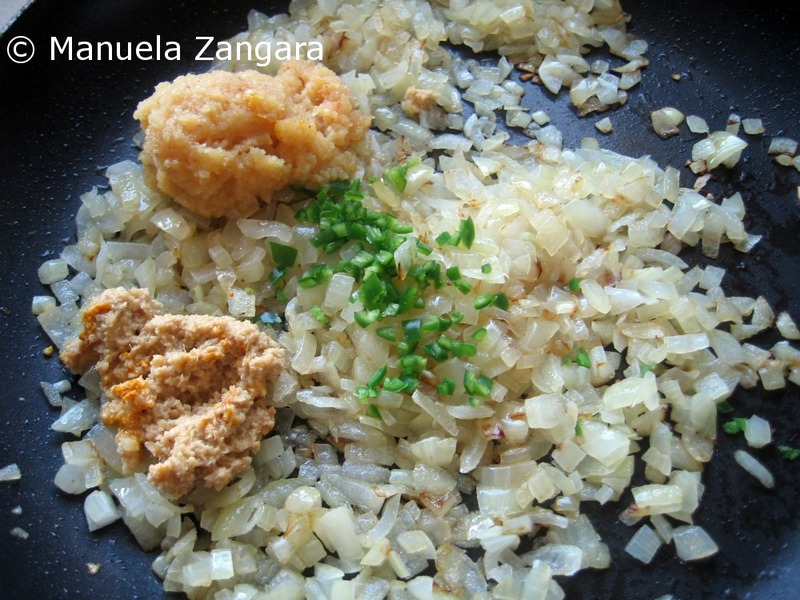 Put the chopped onions and the vegetable oil in a frying pan and sauté until lightly browned. Add the ginger, garlic and green chilli and sauté for a couple of minutes. 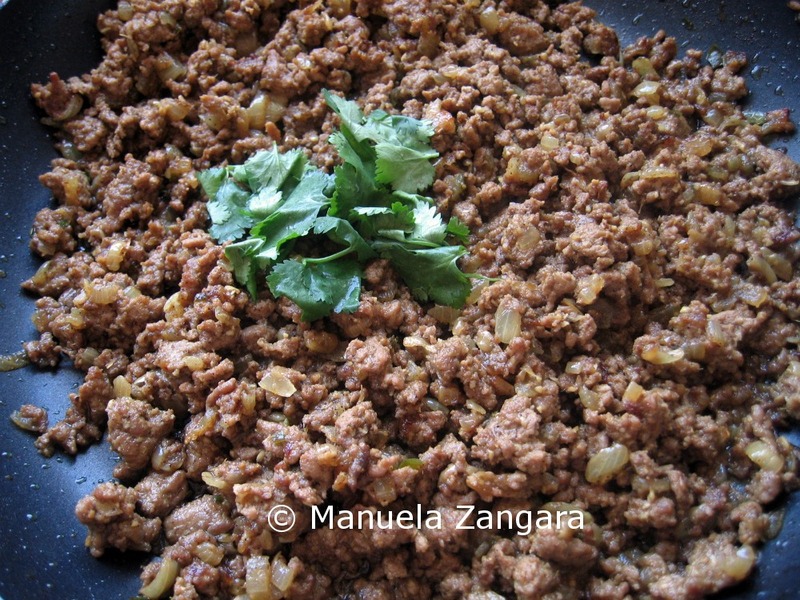 Now add the lamb mince and brown it well. When the meat is brown, add the turmeric, chilli powder and salt and let it cook on a medium flame until the juices dry. Add the garam masala and some fresh coriander leaves. Stir, put the fire off and let it cool down. 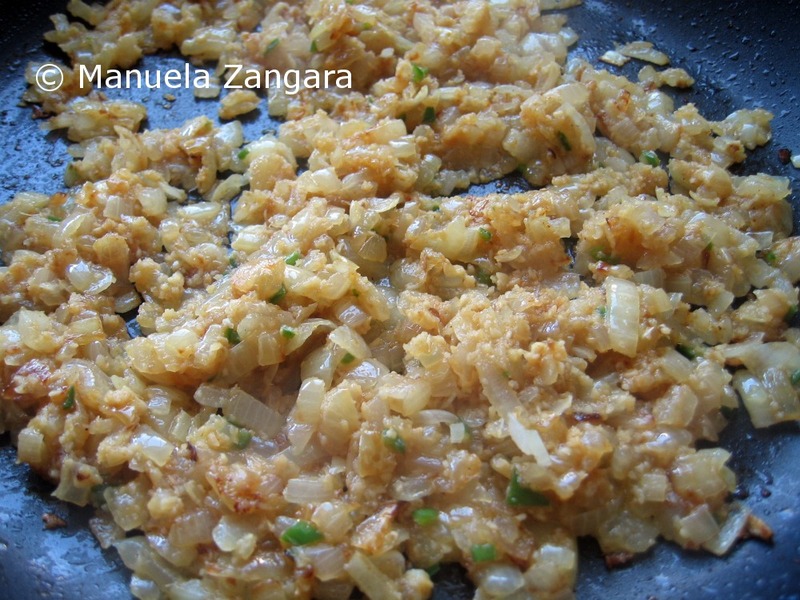 Start by chopping and cooking the potatoes. I usually cut them and put them in a microwave safe container and cook them in the microwave with a little water until they are soft. You can also boil them, but it is going to take a little more time. When the potatoes are ready, keep them aside. 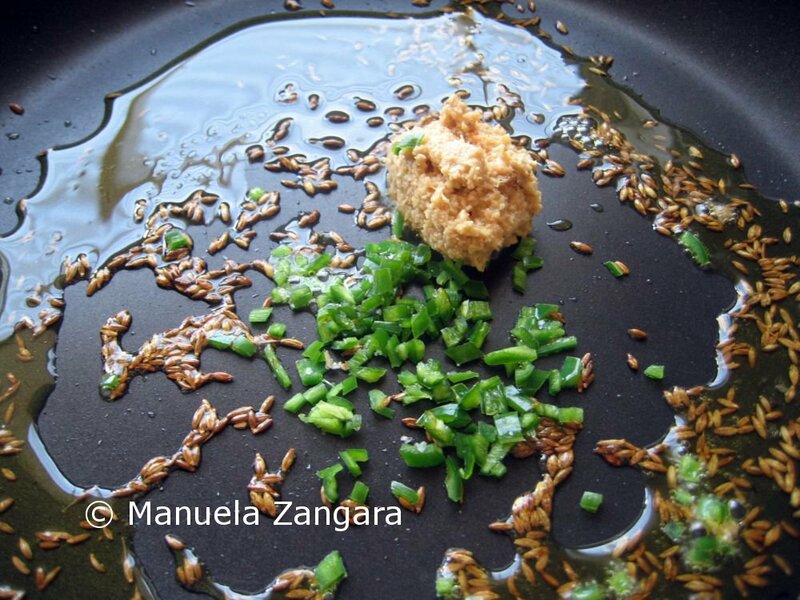 Put the cumin seeds, vegetable oil and mustard oil in a frying pan and let them fry until they start popping. Now add the ginger and green chilli and stir well. 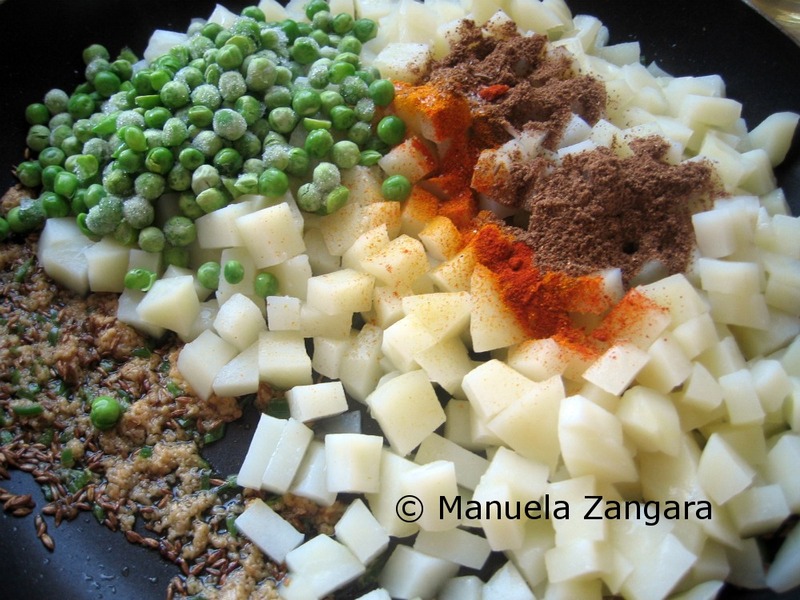 Add the cooked chopped potatoes (including the water they have accumulated while cooking), chilli powder, turmeric, peas, garam masala and salt to taste. 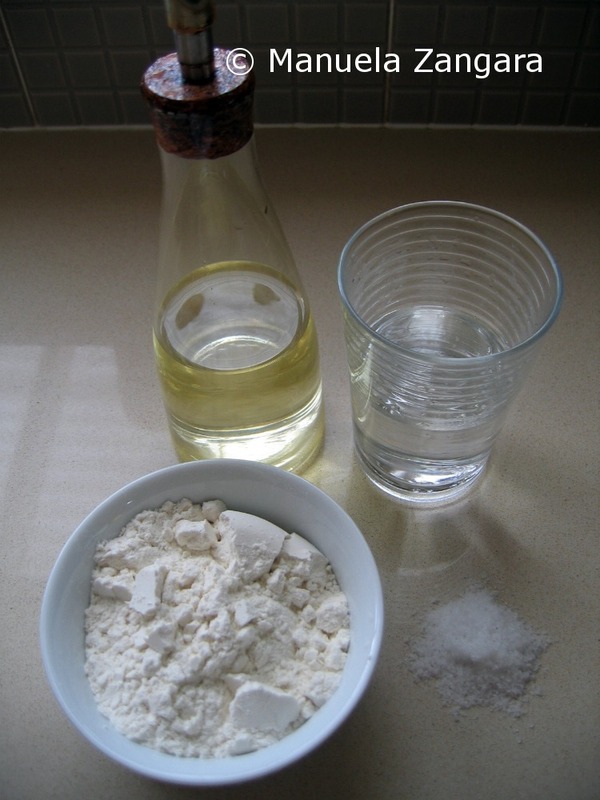 Stir well and cook the mixture until dry. Add the coriander leaves, stir, put the fire off and let it cool down. 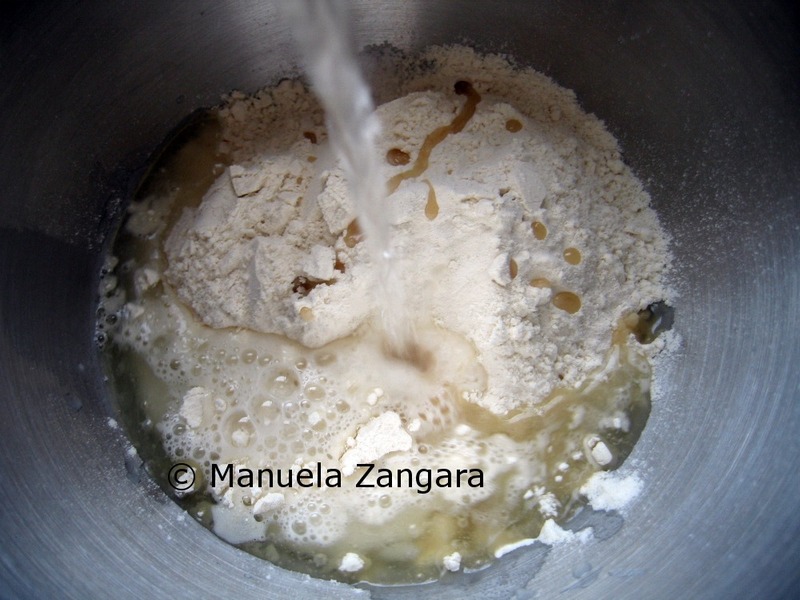 Put all the ingredients in a mixer with a dough hook and knead the dough adding the lukewarm water little by little until the dough comes together. You can knead this by hand as well. 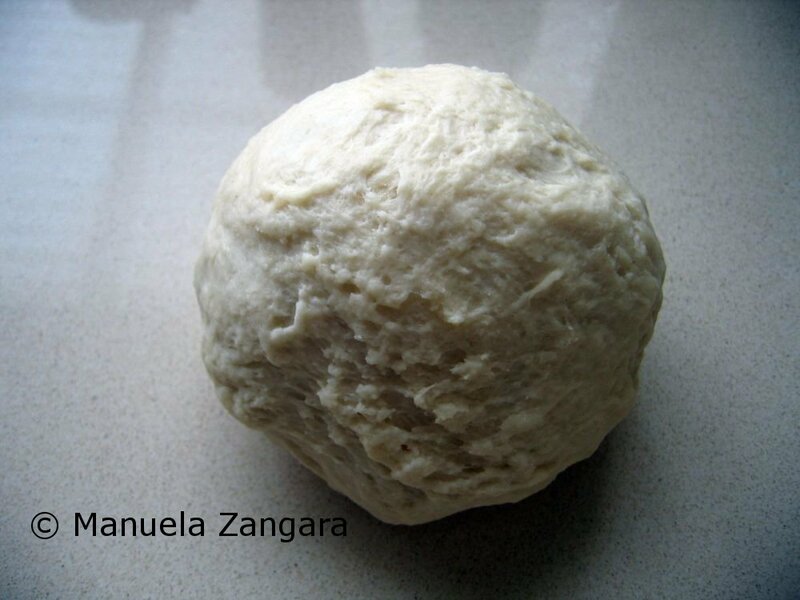 Keep the dough to rest for 10-15 minutes. 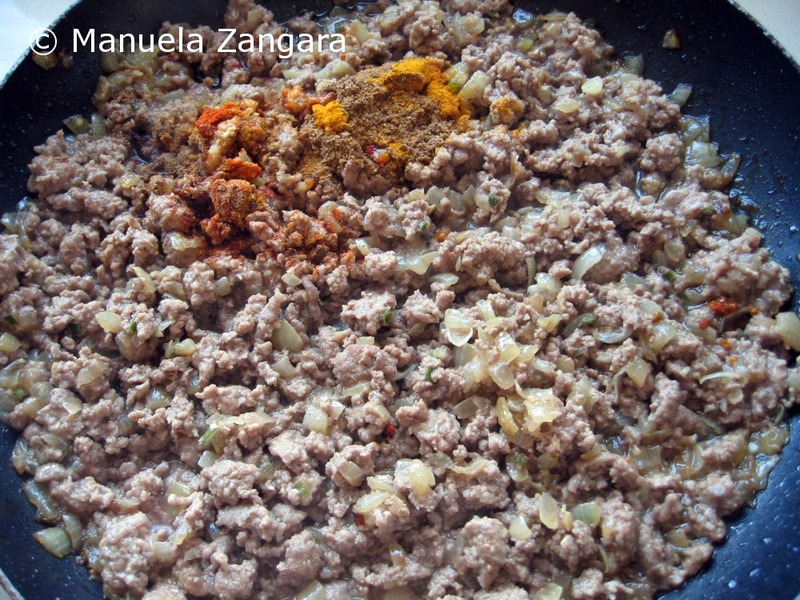 You can stuff the samosa with either the meat or the potato filling, or you can also mix the 2 stuffings together (this is the way we usually eat it at home). 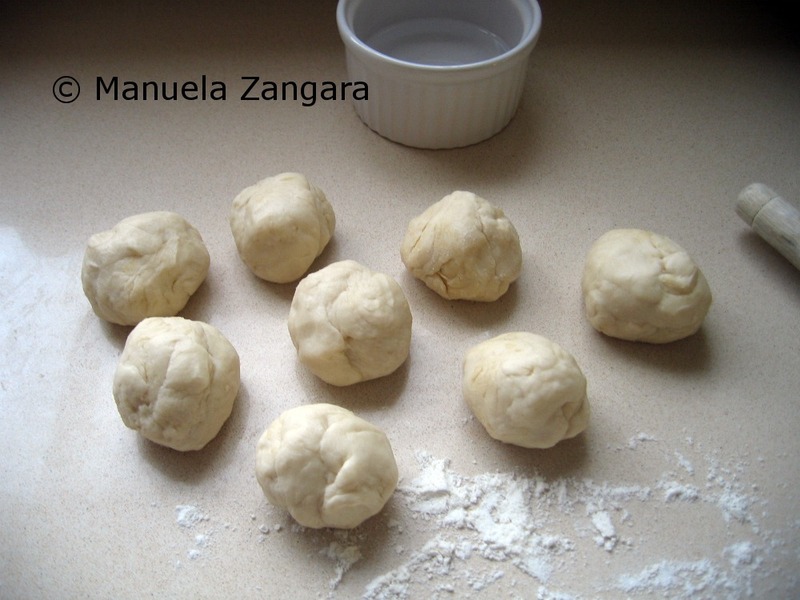 Take the dough, make 4 balls and roll them into ovals. Cut these ovals in half and fold them to make cones, as shown in the pictures. Seal the edge with some water and press it to close it tight. Hold the cone in your left hand and fill it with the stuffing. Close it by folding the open part on the top and seal it with a little water. Deep fry the samosas in hot vegetable oil. 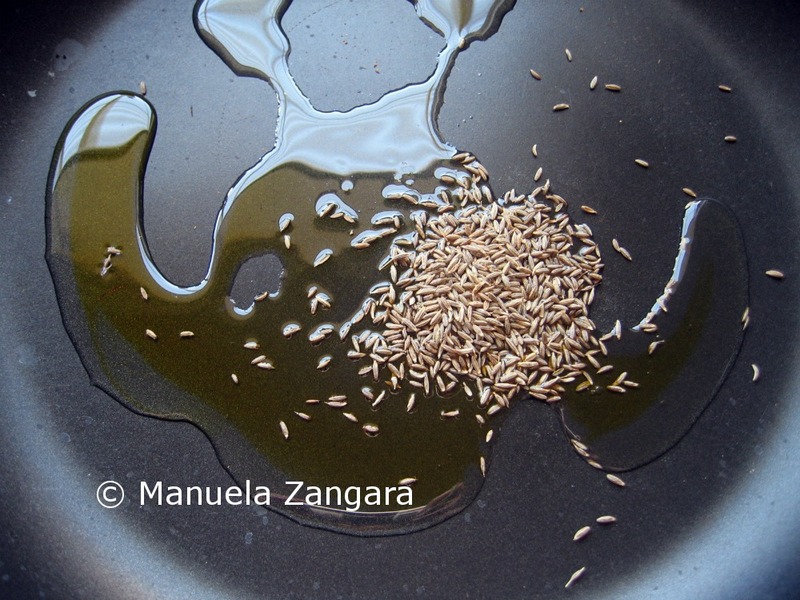 When brown, take them out with a slotted spoon and put them on a plate covered with kitchen paper to get rid of the excess oil. Serve warm with some sweet and sour tamarind chutney (imli ki chutney). first time here…fascinating space you have…love your presentation..
Oooooh…. I LOVE samosas! Delicious! I made my first samosas this fall, but yours are so much more tempting! The fried dough makes an incredible crust…mmmmmmm. Happy weekend, Manu! 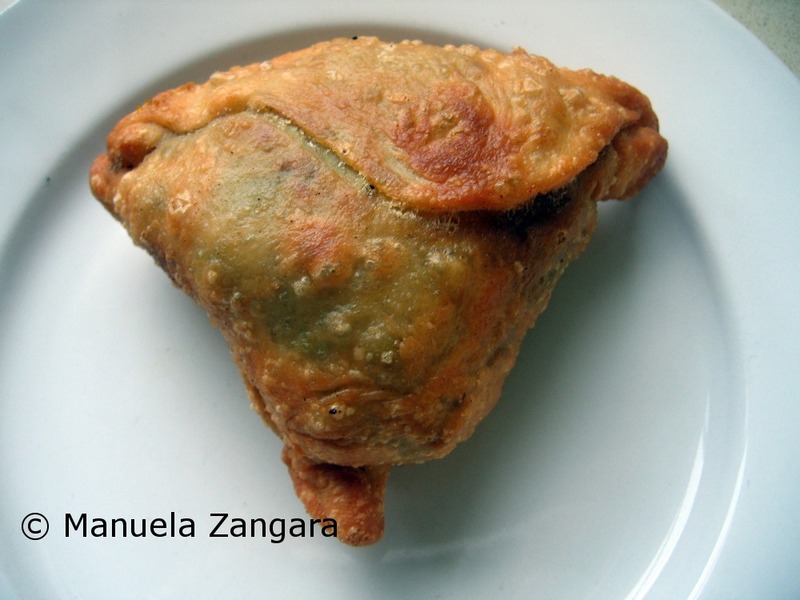 I love samosas..my favorite stuffing is cheese with mint or parsley..yum! 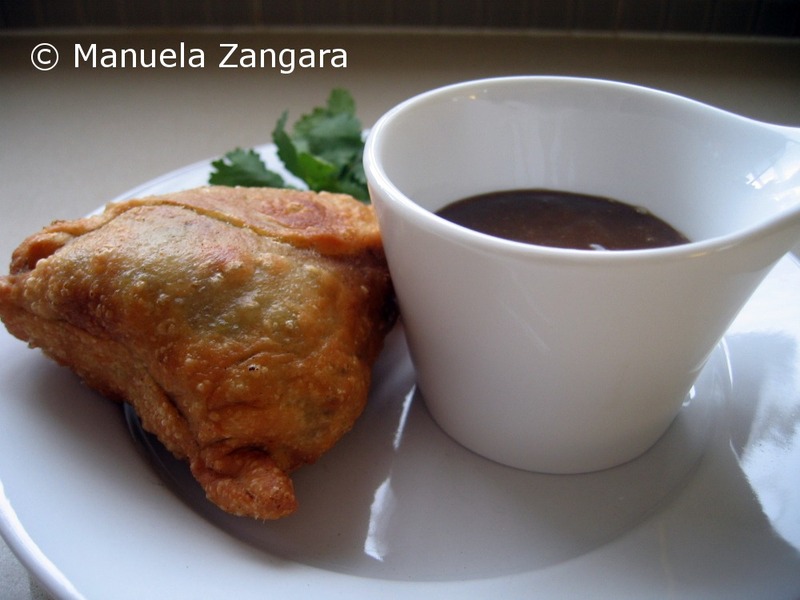 Oh I love samosas and my mouth is watering after looking at your spectacular tutorial! I feel like I could just reach into my computer and grab one. Why can’t someone develop that technology??? 🙂 They look delicious! 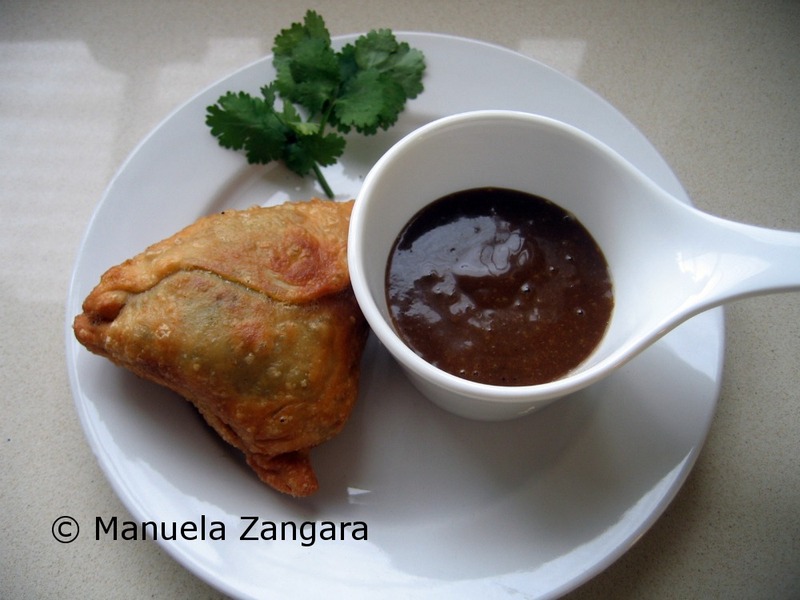 I love samosas too… and i like it with both the meat and veggies, thanks Manu for the steps and the recipe. Anche io amo i samosas, che ho provato solo vegetariani. Qui il tocco in più è dato dalla sfoglia esterna fatta in casa, mentre di solito vengono fatti con un impasto congelato già pronto… ma non c’è confronto!! Great job! I love vegetarian samosas! Oh Manu these look just wonderful! And your step by step photos are perfect! I’ll be trying the lamb recipe soon!! WOW! Your samosas are perfect! How do you stop at one? I would eat up all of them. Hey Manu! I know it has been awhile since I posted but I finally got around to posting new recipes and gave you a shout out! Beautiful recipe as always… I love when you can have bite size treats like this! I never tried samosas but it does look very tempting and delicious!!! Awesome video!!!! I love samosas and yours look amazing. Thank you for the step by step guide to making these too! Hi! manu i like samosa too. 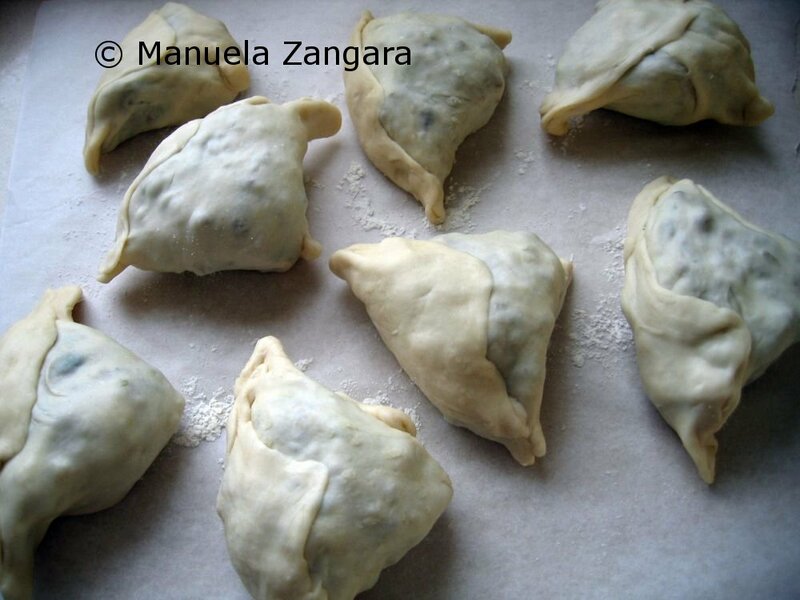 but if some one say plz make for me samosas i’m say no….no..no… it’s take a time but u r make so perfectly brilliant. great job i’m sure ur hubby is happy:). Manu, I love this post more than your regular posts because of the video clip with Indian music with your girls’ voice!!!! THE BEST EVER. I was smiling while you trying to concentrate on making this with fun background noise. LOL. 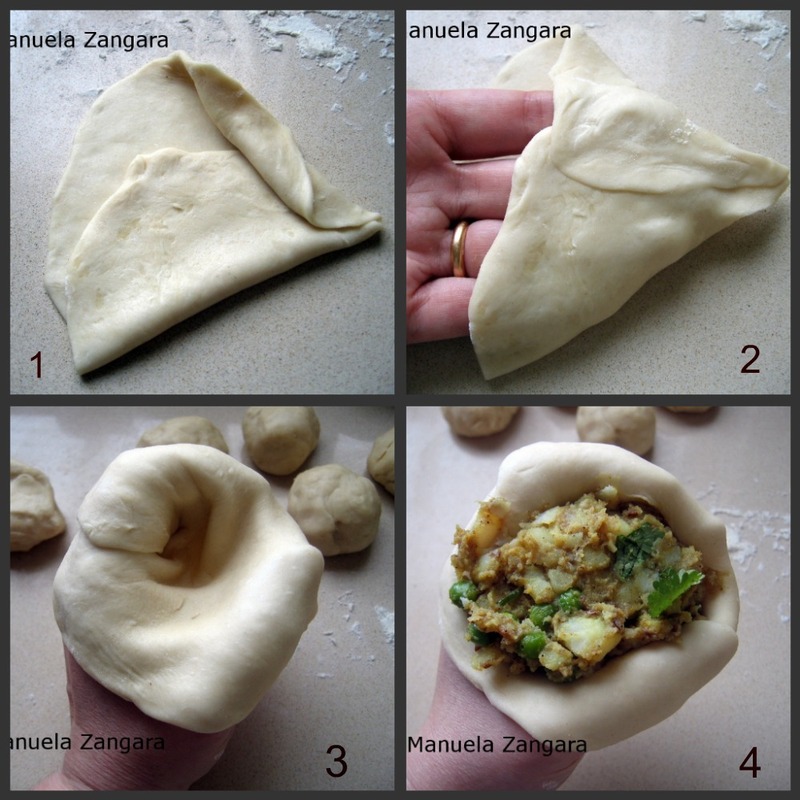 I am amazed how much effort to make samosa, from scratch…everything from scratch. It must be SUPER good. Manu, great to see beginning to end process. 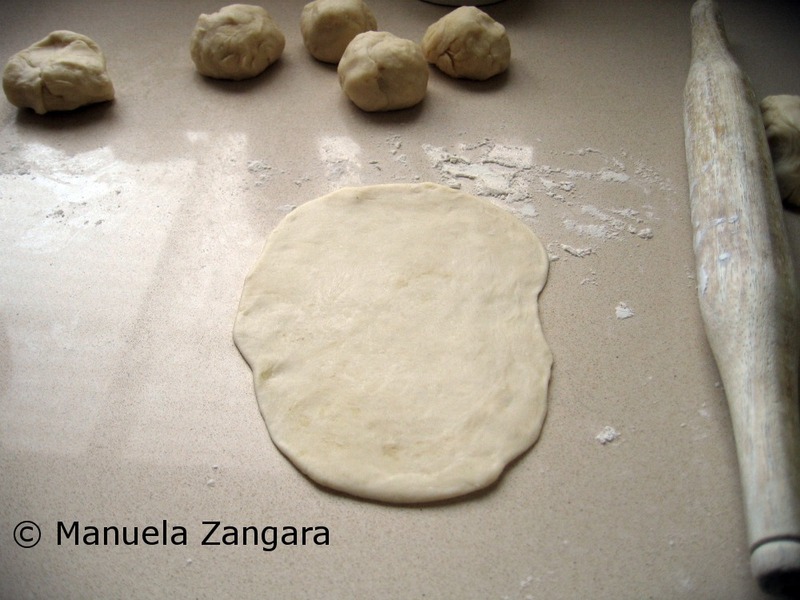 It’s great tip to show in video clip where as I drew on my samosa pictures to show folding process since I could not hold camcorder and folding the dough at the same time. Samosa’s are one of my fave Indian snacks too. Thanks for sharing this recipe, you make it look so easy and they look fantastic. Oooh I have never tried to make samosas. Great tutorial Manu! 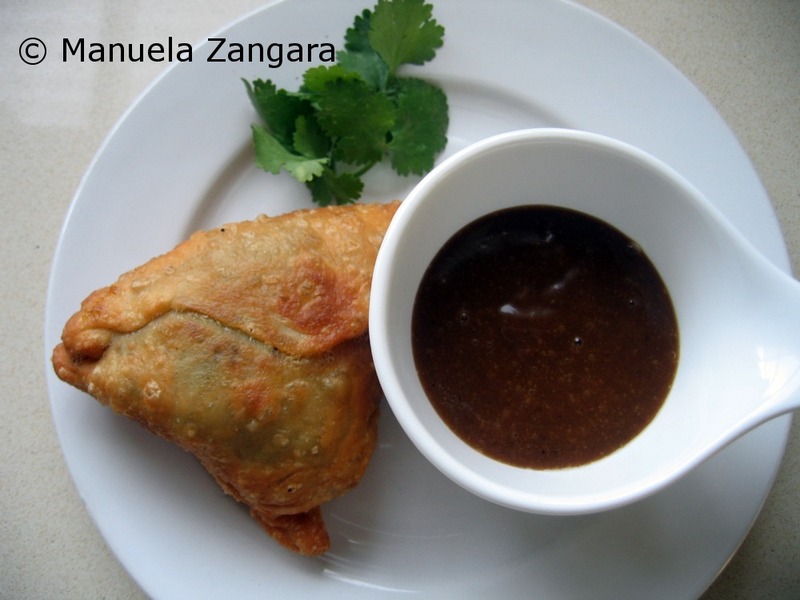 You know I love samosas but I’ve never actually attempted to make them…. I want to try your lamb ones! Sound delish! Hi Manu, I too love Samosa. But I’ve never made them at home. You make it sound easy. Loved the video and background music 🙂 Thanks for participating in the YBR & Have a great weekend! How did I miss this post? I LOVE samosas. I’ve even attempted them a few times. The folding gets better with practice, so my first one is always rubbish and the final few actually look like samosas. 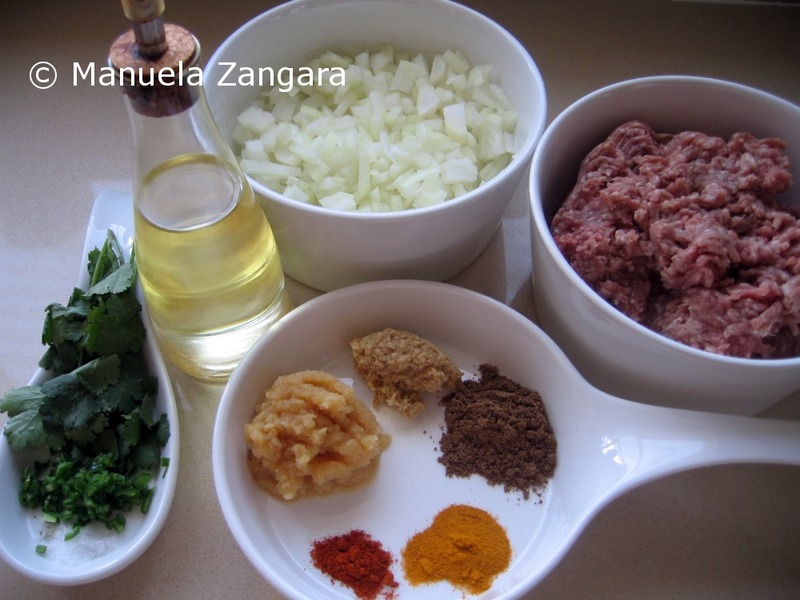 I love your recipe, Manu, and that you’ve added extra flavour to the dough with the cumin seeds. 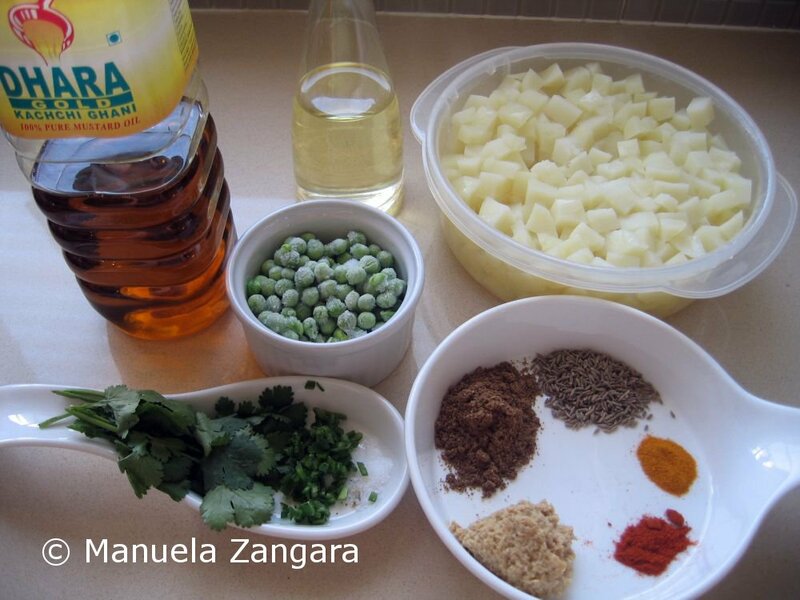 I am regular visitor of your face book page and a big fan of Italian cuisine.As i am an Indian i would like to give you a suggestion that you missed one important ingredient in your samosa recipe.Chaat masala. it will give an incredible authentic aroma and taste to your samosa.Do try and feel the difference in taste. Add a pinch of chaat masala to your filling.You may get it in any Indian store. Hi Praseetha! THANK you sooo much for this message! 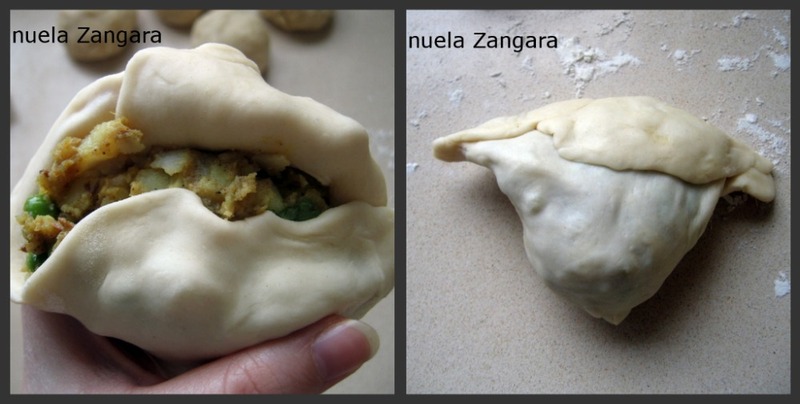 I will definitely try it the next time I make samosas! I actually have some chaat masala at home 🙂 I will let you know how it comes out!!! 🙂 Thank you again for the suggestion, I am sure it will taste delicious!